Stana Katic was born in Hamilton, Ontario, Canada to a Serbian father and Croatian mother, who both immigrated from the Dalmatian Coast in Croatia. According to Stana, “My parents are Serbs from Croatia. I call us Dalmatian because that’s the part of the planet that we are originally from. I have Serb, Croat and even a handful of Montenegrin family members.” She is named after her grandmother and says “It’s an evil-eye name, to protect you from bad things.” She is the oldest child and has four brothers and one sister. During her teenage years, the family relocated to Illinois, where she graduated near the top of her class from West Aurora High School in 1996. After graduating, she studied international law and economics at the University of Toronto, then went on to study acting at the DePaul University Goodman School of Drama and the Beverly Hills Playhouse. Stana moved to Los Angeles the summer after she finished at the academy. She spent the first few months sleeping in hostels and sometimes in her car just to save money, until she eventually got a job selling furniture in a department store and was able to rent an apartment. Shortly after that she met her manager and started to make her way into film and television. 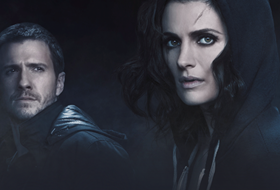 She made her feature debut in the shot-on-video thriller “Shut-Eye” and landed guest appearances on a variety of TV series including ‘Alias,’ ‘The Shield,’ ’24,’ and ‘Heroes.’ Then came the news that changed everything, when Stana received word on May 4, 2008 that she had landed the role of Kate Beckett on ABC’s Castle, beating out over 100 other actresses for the character. Whether in film or on television, Stana has the skill to hit a bull’s eye in every role she takes on. 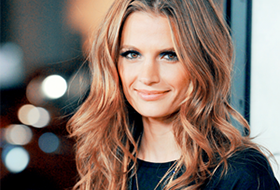 Stana is an avid lover of science, travel, music and art. Beyond brains and beauty, she is also a natural athlete who plays multiple sports and often performs her own stunts. Stana has an alto-mezzo soprano voice and sings so well that producers have used her voice on ‘Castle’ and for the sultry theme song in the third film of cable trilogy ‘The Librarian: Curse of the Judas Chalice,’ in which she also starred. Stana’s commitment to her craft has caught the attention of industry A-listers and earned her the respect of her peers. Her goal is to fashion memorable characters so compelling that audiences lose themselves in the story for a transcendent moment that will reverberate long after the movie’s end. In 2010, in an effort to improve the environment and create a greater sense of community in cities across the globe, Stana started a campaign called The Alternative Travel Project, which encourages everyone, everywhere to go car-free for just one day. The campaign was so successful it started a movement with people from around the world writing, tweeting and blogging about it. ATP focuses efforts on creating a worldwide community of people looking to enjoy the social, health and environmental benefits of traveling alternatively (by bike, walking, public transit, etc). In January 2015, The Alternative Travel Project was granted official 501(c)3 non-profit organization status, meaning that all donations are tax deductible. Visit the official website to make a one-time or recurring donation. Because of her work with ATP and her passion for environmental causes, it was announced in December 2014 that Stana had joined the Young Hollywood Board of the Environmental Media Association. She married her longtime boyfriend Kris Brkljac, a business efficiency consultant, in a ceremony at a private family monastery on the Dalmatian Coast in April 2015. She currently resides in Los Angeles and holds dual citizenship in the United States and Canada.